Yeah, but: A bus station without amenities is a curb. The Long Version: While I'm far from being a world traveller, I have developed a certain appreciation for bus stations. I've been through the one in Buffalo, New York, on several occasions, and I was recently lucky enough to spend four hours in it during the middle of the night. Writing a review seemed like the only sensible course of action. Bus stations require certain amenities. First of all, there needs to be a comfortable place to wait. It needs adequate restrooms, some food options, and a place to buy traveller's necessities. All of this should be prominent and close to where the buses load and unload – ideally, within sight of the platforms. It needs to have good wayfinding and information, be clean and welcoming, and be kept in good repair. Buffalo actually manages to do much of this reasonably well, despite fundamentally being a bus station. 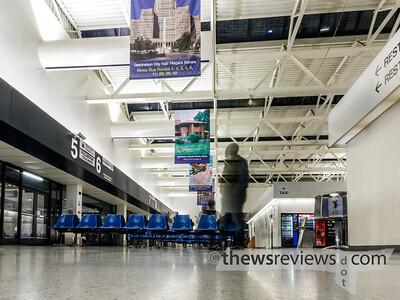 Buffalo's bus station – officially the Buffalo Metropolitan Transportation Center – seems to have been designed by someone who's really fond of international airports, because the seating is arranged in rows with enough space to stack weeks' worth of luggage between them. And the generous open space has no bearing on where the doors are for the bus platforms, which might have made sense, leaving the whole result oddly off-scale for the people within it. With chairs set only the middle of the hall, Buffalo doesn't have any seating for people who prefer to have their backs to something solid. This might make it easy for the station's police to keep an eye on everyone, and discourage certain elements of local commerce from setting up shop, but it's a tough spot to be in. I wouldn't consider listening to music through my earphones in this layout – it would be far too easy for someone to come up to be from behind while I'm unaware. I hate surprises. 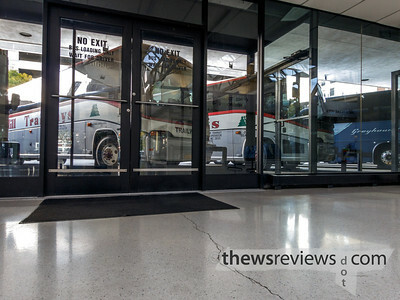 The bus platforms are signed according to carrier, but if you want to know where to wait for the Greyhound to Toronto or New York you'll need to ask the helpful attendant. And then the bus might still need to pull in somewhere else – such is life. At least the station designers realized that the weather in Buffalo isn't always pleasant, and the waiting area is indoors with double doors to keep the wind out. If only it was always like this. Food options are a mixed success. Vending machines provide the most reliable service, and there's a change machine located in a completely different part of the building for people who don't have those archaic dollar bills. There's also a small take-out operation, quite literally a hole in the wall, that provides food that's not robust enough to be dispensed by robot. I didn't see hours posted for it; it was open past 3am when I was there most recently, although when I've passed through on other nights it has been closed. Finally, there's a small restaurant-like operation that's occasionally open – with different hours each day of the week – that I've never been lucky enough to experience. There's nothing resembling a convenience store, magazine stand, or drug store for any other necessities. There are a few power outlets scattered around that people were able to use to recharge various devices, though, which is always nice to have. They're not conveniently located for travellers, having been intended for power-washers and floor polishers, but at least they aren't kept locked up. The restrooms in the Buffalo station are another level of experience. Prominent and close to the platforms they solve two problems, and the mens' is able to accomodate quite the crowd if it needs to. 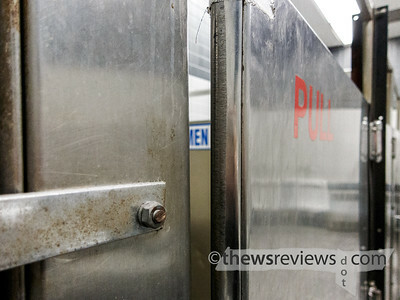 But its barrier-free walk-in intentions must not have taken sight lines into account, because the entrance has been retrofitted with an oversized stall door. From the interior it blends into the wall of stainless steel doors, making it into a lobster trap for the tired, disorientated, or intoxicated. To add to the ambiance, instead of having a sign marked "EXIT" this concealed door simply says "PULL". Yes, pull. It doesn't have two-way hinges, and being one of the few patrons to understand what the sinks were there for, getting through this door is not an appealing prospect. I'd hook it open with my boot, or hope for someone else to swing it open, and use my elbow to defend myself from it. The bus station also houses the city transit bus, running under the NFTA banner. It took me a while to find out what that stands for: Niagara Frontier Transit Authority. I hadn't realized that Niagara is still a frontier, and haven't heard that term used to describe a civilized border in years, but I suppose it fits. Indeed, I did go from the pinnacle of Canadian urban sophistication to the American hinterland in less than two hours. But the NFTA name struck me for a different reason. After all, this is Buffalo the City, named after Buffalo the Animal, which has a particularly brutal and genocidal history on the western frontier. I wouldn't expect them to want to remind people of that, but I've been wrong before. Another interesting Buffalo experience was to have an armed agent of the government approach me and ask to see my papers. Politely, of course, and when I said that I was returning to Canada he lost interest, but this has happened before when I travel by bus, and I always take offense. It seems a little odd that these blanket stop-and-question episodes don't raise the hackles of the live-free-or-die crowd, but I have to wonder how much of a difference it makes that it's immigration enforcement doing the work. Another happy thought. 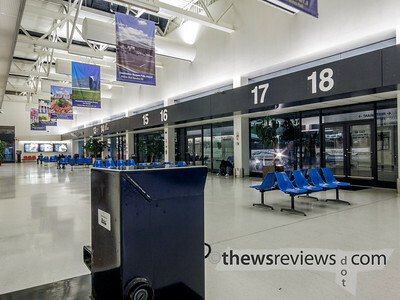 Being a border town, Buffalo sees a fair bit of traffic as a waypoint, but not much use as a terminal. That's a bit of a pity, because the station is well-situated in downtown Buffalo, and that's an area that could really blossom with more tourist and commercial activity. 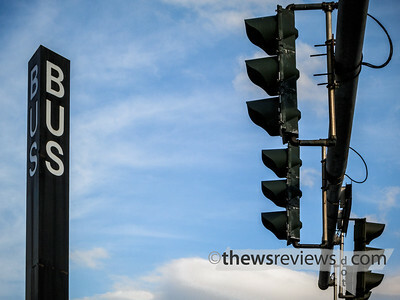 A bus station without amenities is called a curb. 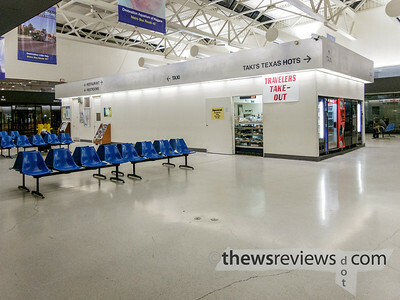 The Buffalo station is functional if unwelcoming, capable of handing high volumes of stopover passengers but without the deeper considerations that would make long layovers more bearable. Long-distance bus travel is always an arduous task, and the stations need to be very durable, making this a very tough bit of architecture to succeed at. Buffalo isn't as good as Chicago, Syracuse, or New York; I'd say that it's about on par with Detroit. But it's vastly better than the Toronto Coach Terminal, which happens to be my home station. Reminds me of the bus stations I visited when I traveled from Orlando to Atlanta back in January. Buffalo reminds me of the Atlanta bus station. Open-back benches and bucket seat chairs are everywhere. Traveling by bus in this country is considered for a lower class of people. All the infrastructure money is spent on airports, where the better class of people travel.